iCloud encompasses so very many different features and fun bits that it’s surprising to realize just how much you can do with a free account. Let Macworld’s editors help you get the most out of it with our new iCloud Starter Guide. iCloud does a lot of amazing things: It keeps your mail, contacts, calendars, reminders, and notes in sync among your various computers and iOS devices. It instantly (almost magically) copies that photo you took of your cousin on your iPhone to your Mac, iPad mini, and laptop. It lets you work with your Macs from afar. It helps you find stranded and wayward devices, and lets you know when your friends are nearby. And it does it all for free. This book collects all the material we’ve written in the last year on Apple’s sync service, and we hope it will help you get to know iCloud and learn how best to use it in your life. We explain what services actually make up iCloud and go into detail on each one. We help you set it up, and offer tips to make the most of your free 5GB of storage. And we go over what you get with Apple’s free iTunes in the Cloud functionality as well as $25-a-year iTunes Match service—and whether you should sign up for it. This book focuses on OS X 10.8 (Mountain Lion), Windows 8, iOS 6, and iTunes 11—but we still have helpful hints for those users with older operating systems. 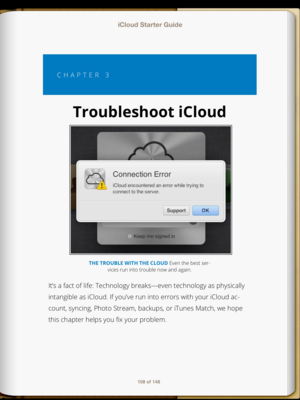 And speaking of hints, we’ve also gathered together a ton of troubleshooting advice on when iCloud goes wrong. Have problems syncing multiple accounts, merging contacts and calendars, or with iTunes Match? We’ve got a slew of answers and suggestions for you, courtesy of our iCloud experts. Want a peek inside? You can download a free PDF preview of the book from our website. To get our iCloud Starter Guide on the device of your choice, you can purchase it now from the iBookstore, Kindle Store, Nook Store, and Google Play for $3.99. You can also pick up a bundle of the book in all formats—PDF, ePub, and MOBI— for $4.99 or as a PDF for $3.99 from our Web store. We hope you have fun getting to know your new iPhone 5. If you also recently picked up an iPad or iPad mini, check out our iPad Starter Guide and iPad Mini Starter Guide. We hope that you enjoy our Starter Guide, but, even more important, that you enjoy iCloud and find ways to incorporate it into your daily routine. 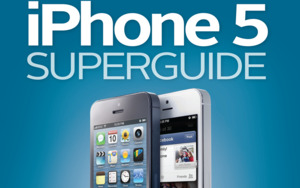 If you want to learn more about the devices iCloud runs on, make sure to check out our available Superguides including our iPhone 5 Superguide, iPad Mini Starter Guide, and Mac Basics Superguide for OS X Mountain Lion.